Warning: Sentimental post. All ITA graduates and sang-froids may want to give this one a pass. I hate goodbyes. Even "so longs" are tough. I do my very best to avoid them and carefully did not arrange any goodbye parties here (though I did get surprised by one, and arranged a second small dinner with the "Fab 5"--don't ask). I'm on my way back home--twenty-five years after leaving New England, I am heading back. My new blog is live and should be in action shortly--it's all about finding out that repatriation is harder than ex-patriation. Or so everyone tells me. I think I have explained in other blog posts that I am not leaving Brazil, but rather going to the USA. Why am I going? Not because of security worries, exchange rate problems or even the absolute horror of the thought of four more years of Dilma Rousseff. No. I am going for my kids. My kids are half-Brazilian and half-American. They are seven years old. We have lived here six years which means they have no idea what it means to be American. 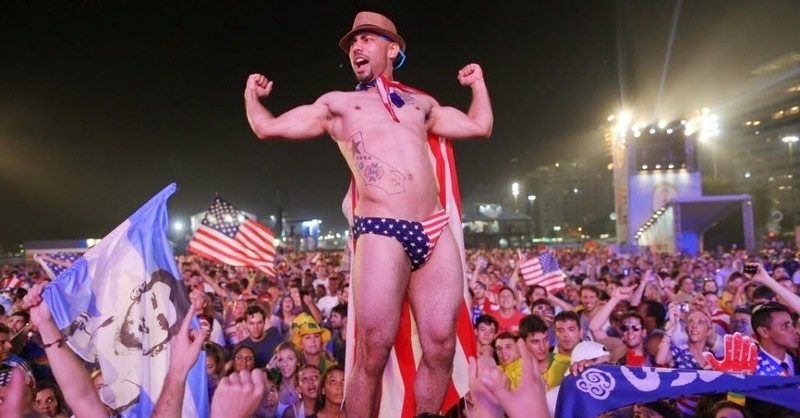 They can sing the Brazilian anthem; they don't know one word of the American. I want them to ride a yellow bus; I want them to be in public school. I want them to know that the USA is more than a Target store and Disney World. By no means do I think that the US is all right about everything and everything is better there. No, there are many things I will miss about Brazil and the recent days have made that conviction even more acute. The absolute warmth, humor and generosity of Brazil--as a country and as a people, well, they are unparalleled. I will truly, madly, deeply miss a number of friends here and their capability to make me laugh until I cry. I can only hope that we can carry the humor and love through skype and emails. We must. We have to. 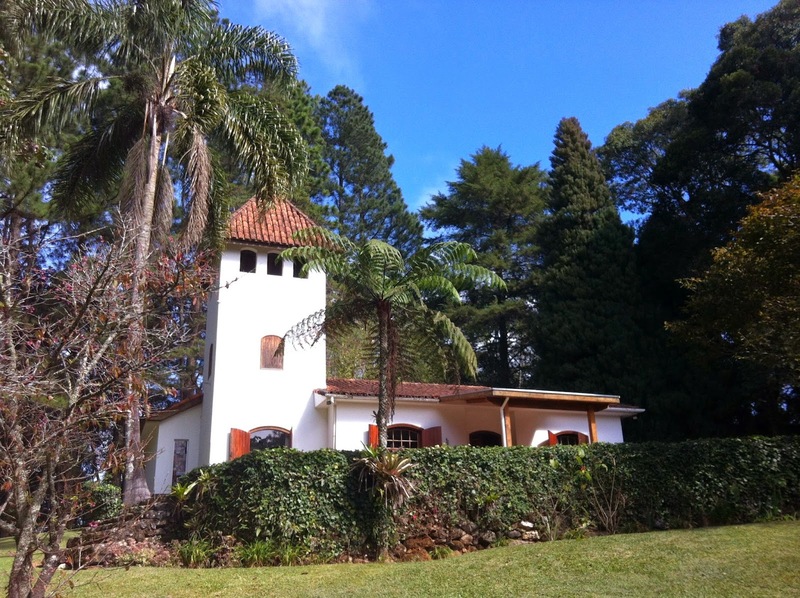 This weekend we said goodbye to the Casa do Alemão, the German house, that we have rented for the last couple of years. It is the closest thing on Earth to paradise, in my opinion. If paradise has giant venomous spiders and cackling monkeys, that is (in the 7 year old twins' minds that is obvious). And though the leaving makes me sad, it also made me smile today. The view from the Alemão. Which never changes. As I walked through the remnants of a trail we had cut two years ago for the twins to find some pinhão (pine "berries" from the araucaria trees--kind of like chestnuts. Delicious), I realized that Brazil was already adjusting to our departure. In fact, almost nothing remained of our trail but the memories. The trees and bushes had grown up through everything. Even the monkeys had wiped out the remains--all the pinhão had been eaten and the husks left in a silent mockery. Life goes on. The Alemão will have new residents. The spiders, and hawks and monkeys and hummingbirds will have new admirers. The woods and trees have permanent protectors in our friends Rob and Pri. The house and its property will be there when we visit again in December. 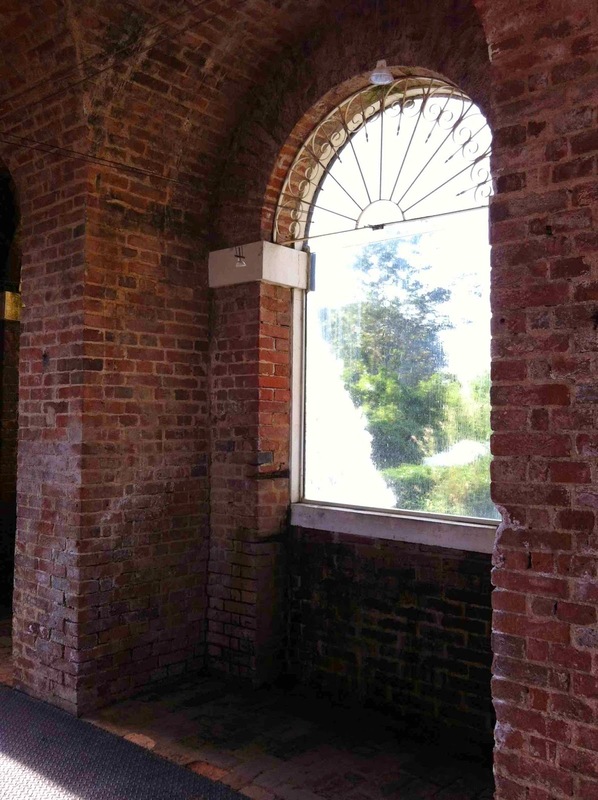 The trail will be gone, and our personal effects from the house, but the exquisite beauty will still be there. Life, and death, go on. On Friday we spread the ashes of our 14-year old labrador Caju in the ranch's beautiful lake. 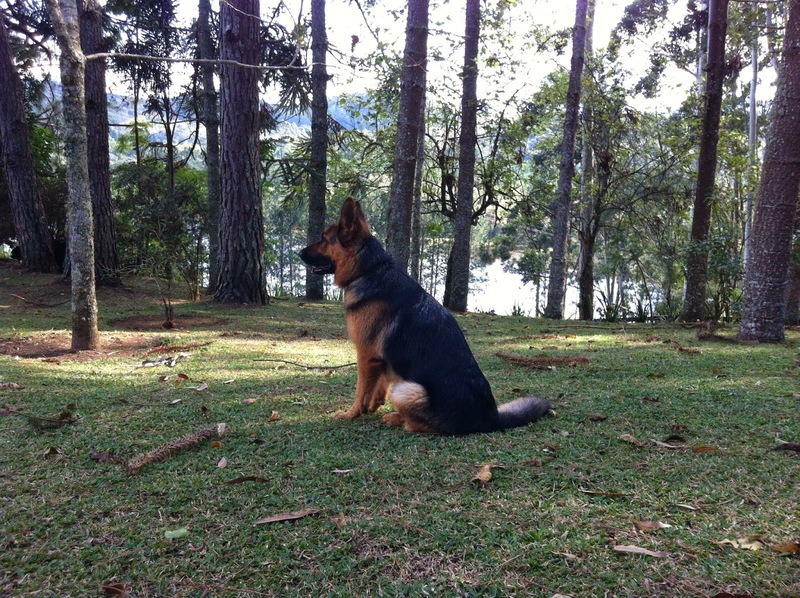 From whence he came.... Caju was a puppy at the fazenda when the fazenda was itself new to our friends. 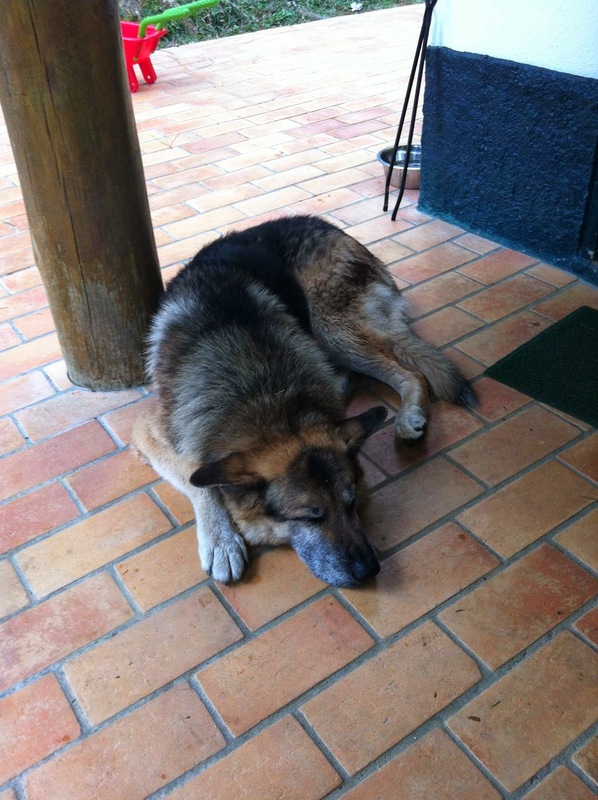 And as the wind ruffled the fur of his now-forlorn and decrepit best friend, 12-year-old German shepherd Cafu, three other young dogs raced by to chase the horses. And so it goes. 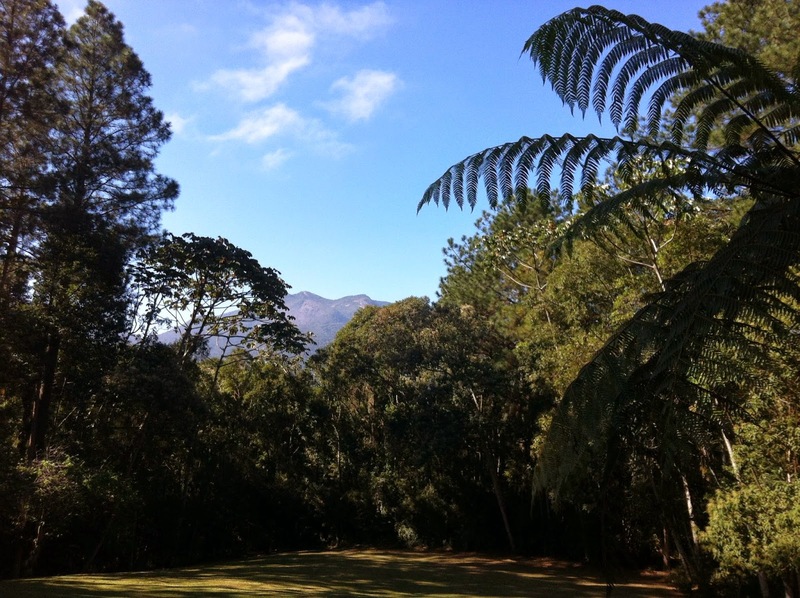 I will miss you, Brazil, but I realized this weekend that I leave you not. I am taking you with me. Every time I kiss a tight-lipped Yankee on the cheek to say hello, I take you with me. Every time I save a fuzzy spider that gives me the creeps, I take you with me. And every time I feel the warm wind blow (perhaps rare in Boston), you are with me. Shall we go? Closing the gate on this chapter. And so it was, Brazil's semi-final match against Germany last night, completely horrifying. I call it "horrifying"; my husband perhaps more rightly put it as "astonishing." I think most Brazilians would not have been surprised to have the national team lose to Germany (as one Brazilian friend put it crassly but directly "we poop our pants when we have to meet that team). But how does a team in the World Cup semi-final lose 7-1? That's the score of a first round match when a small-country team meets a titan. Or not. The small-country team (Costa Rica) this year fell to the Netherlands in a penalty shoot-out in the quarterfinals. Now before I go on, I have to admit that I have not read a single newspaper story this morning in spite of my newsfeed and my house being full of them. I don't want to know. I do not want to know the superlatives, the mass beating on the chests, the wondering about whether this loss is the bringing down of a political system. Or at least Felipão, our coach, who seemed to have some kind of serious mental issue this time. How he could stick by two players who I will not name, who did nothing, during the whole Cup, I will just never know. As my kids would say: "brain fart." A blog full of farts and poop this is. You know and I know that I know nothing about soccer. I have said it again and again. As in most organized sports, I don't care who wins in any real sense. I do not go into mourning when the Oakland Raiders lose. Possibly because I only chose to cheer for the Raiders as a 12 year old to annoy my brother. I can't name a single player. I wouldn't be able to tell you which formation they use or who the coach is. After three weeks of the world cup, though, I can name every player on the Brazil team. I have heard, absorbed and read comments from friends, strangers and of course, BH. In this sense, I have come to care about them a bit. I will never ever forget the bewildered look the camera showed on Fernandinho's face as the fourth goal in seven minutes was scored on the team. I have no other word for how to describe the team: 'bewildered'. Most of us at the house where I watched the game were hoping for a blackout to end the game quickly. Just call it for Germany, and let these poor lost souls go home. We stayed for a couple of hours after the game to chat with our friends to whom I will soon say goodbye as we leave two weeks from today for the USA. The women were much more positive than the men: one wife had been cheering the whole game for the bewildered Brazilians. The other wife came up with a list of four positives about losing as we did. One husband came up with only one positive: at least we didn't lose to Argentina. And BH? Well, BH was in shock for most of the game. Completely deafeningly quiet. There really was nothing to say. Nothing at all. At the end of the game, he came and sat at the table and listened a bit. Then he went to the kitchen and got a bottle of cachaça and a shot glass. He toasted us, and had a sip. Life goes on. And Brazil? The streets of this 11 1/2 million population town were quiet. So quiet. Not a single firework. It was if we had been obliterated by an 11-person bomb. And in some ways, we have been. In some ways, we haven't. I went to pee, a goal was scored, I flushed, another goal; washed my hands, another goal. I left the bathroom, goal. I sat on the sofa: goal. Can you imagine if I had had to poop? 7-1. It's astonishing. That is all. 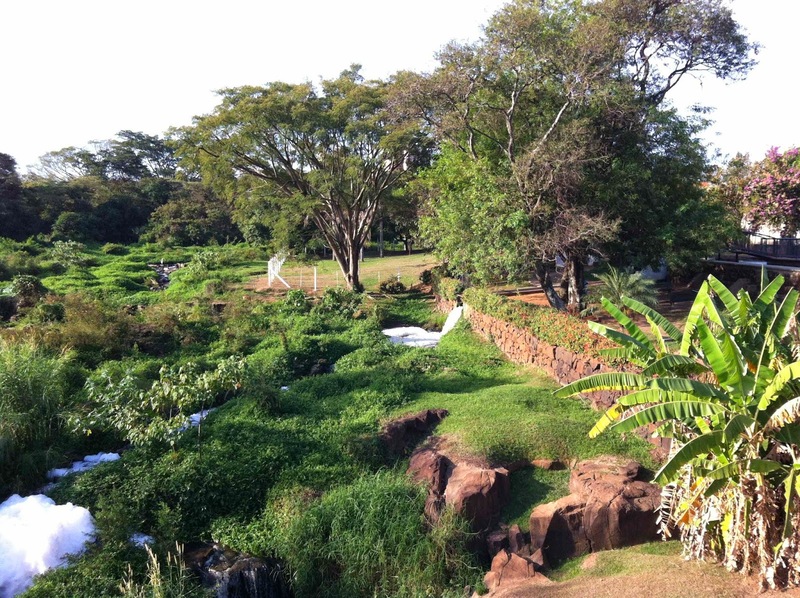 I am spending a couple of days in Piracicaba, a medium-sized town outside of São Paulo. I have blogged on it last year. 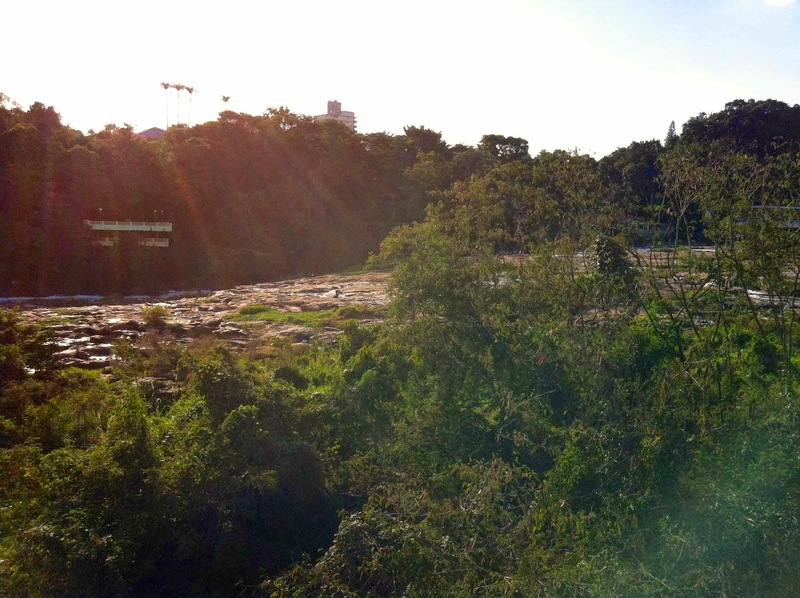 The crown jewel of Piracicaba is its huge river--fast moving with a rocky bed covered with water. Or not. Yesterday I went with my sister-in-law and our combined three kids to the Museu de Agua or Water Museum. It's a tiny place, with no real explanation of what goes on in terms of treatment and pumps and whatever. The tiny pump house was practically taken over with three huge intake or outtake or missile tubes. It was hard to know. And some black and white photos of the good old days. 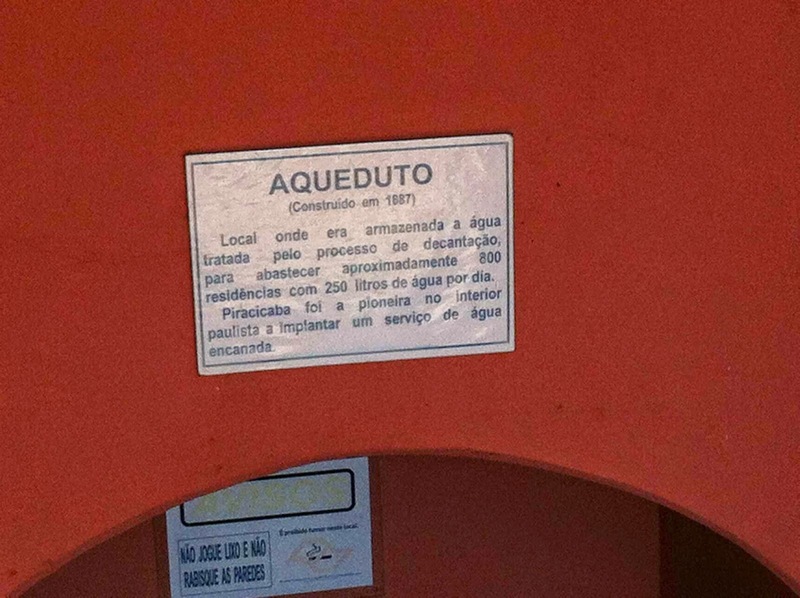 Piracicaba has quite a history of firsts, including water treatment technology. The Museum now consists of two buildings--the pump station and a building that houses three large aquarium tanks (well, three foot long tanks--I am wondering what happens when one of the fish in there reaches its predicted length of 6 feet. On second thought, I'd rather not think about it). Water rushes in a man-made falls at the side of this building, and under your feet covered by a somewhat sketchy metal grill. On the bright side, it's quite pretty not covered by water. One of the best features of the museum is its view of the river. Or what was the river. There is a beautiful part of the river that rushes over a rock bed, splashing and jumping and zooming downhill. But not today. It is all dry. Instead, there is a tiny trickle on the far side, and a few lost-looking herons picking about looking for fish. I hope they found some. After the museum, we went to the park where we played soccer on crunchy grass. The current drought is ugly. Yesterday there was finally an article in the newspaper that spelled out disaster. 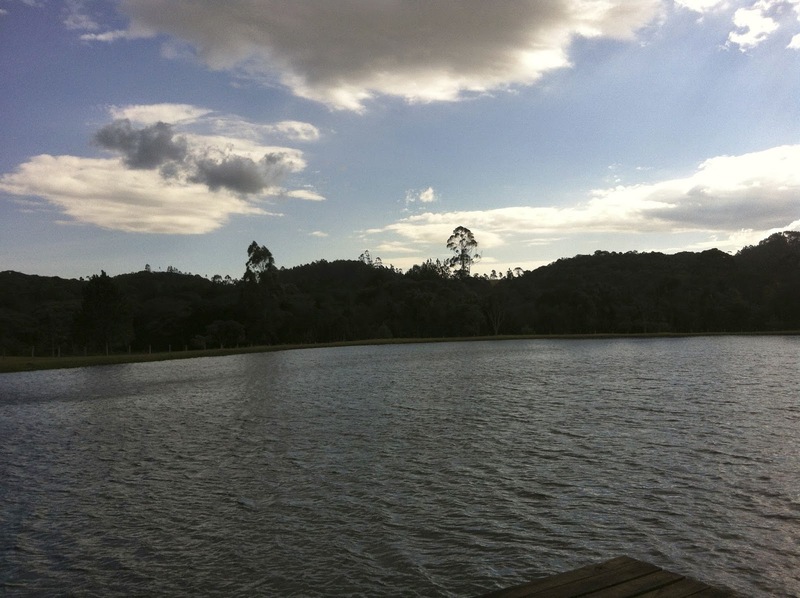 We are now trolling the "dead volume" of all of the water reservoirs in the São Paulo area. And its disappearing faster than expected because people are not taking this seriously enough. We are not going to have enough to through to September and some more rains. And of course this has a name: El Niño. I almost hate when this term comes up--it has another name which is Bad Planning. We are not prepared for drought in this state--there are too many people and not enough supply. I miss the river. Hope it comes back soon. Painting by my 7 year old son. Personally I think this painting is brilliant. 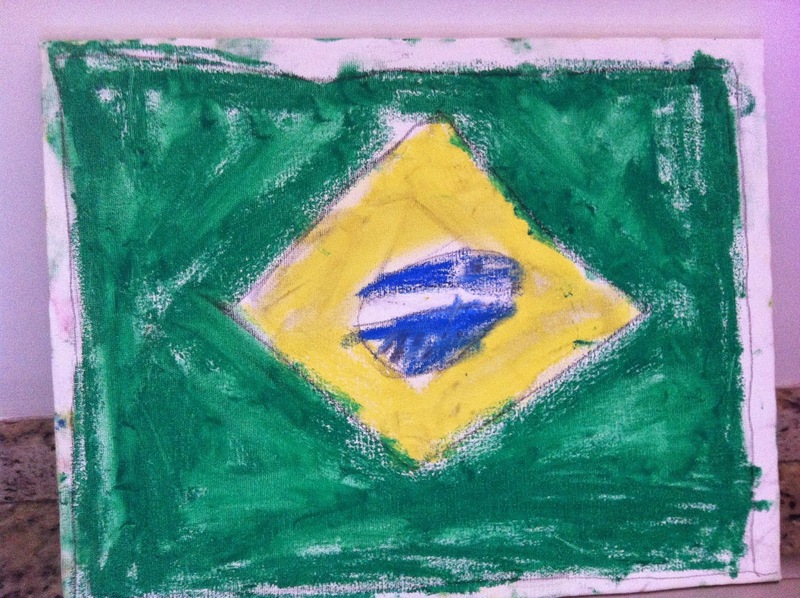 One of my seven-year olds painted it during his last few weeks of school as we headed towards the world cup. However, it turns out that it (and other paintings) are causing me some major problems in leaving this country. When I got an estimate for our move almost two months ago, the moving company representative spent some time walking around the house and taking photos of art. Not only the large oil painting of the São Paulo coast that was a present to my husband five years ago and is worth some money. Not only the art created by my artist uncle--paintings, constructions.. Not only the acrylic paintings that my dad and I play around with--copies of Matisses and Tarsilas. Every single canvas. 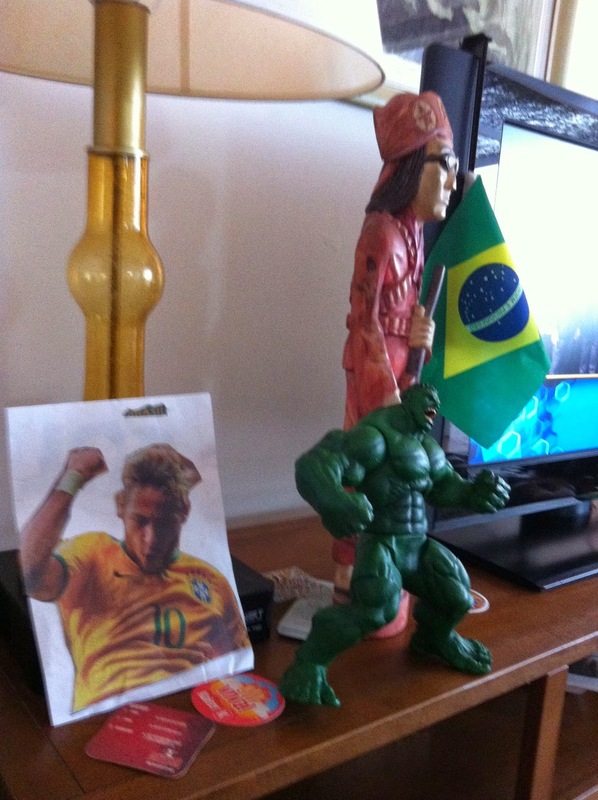 Including this Brazil flag by one son. Including scribbles of dragons and snakes and whatever else. Including a painting done by my stepson when he was ten--a self-portrait in the style of Miró with a signature of said painter at the bottom. These photos all go to a place called IPHAN. Instituto do Patrimonio Historico e Artistico Nacional. It's the National Heritage police. They make sure that no one is taking artwork of real cultural value out of the country, at least without paying taxes. That means that every single canvas in our house is being analyzed by the art police. Normally it takes the art police 20 days to "liberate" your stuff. Unfortunately they decided to have a strike during the review period of my "art" and now the backlog is more than a little long. According to my movers, "maybe this week, maybe not". Keep your fingers crossed for no more strikes--remember that customs doesn't work on any Brazil game day...and I can think of more than a few other organizations who might be feeling the need for a strike too. 2. At minute 70 of the Uruguay-Italy game, I was online with an Italian friend who was getting upset about the red carding of the Italian dude and I said "don't worry, game is not over, Suarez will probably bite someone." I'm not kidding--it's right there on my facebook page. And at around minute 80, Suarez did bite someone. Okay, so Italy lost but that's not the point. So, I'm feeling very chuffed with myself. Yeah, I didn't see Costa Rica coming and yeah, I've gotten most of the score predictions wrong but I am good with some of it. And I'm enjoying the heck out of the rest of it. A few friends have sent me the link to Ann Coulter's deluded rant against soccer yesterday. Clearly she has never watched a game in her life. Does she have kids? God, I hope not. Anyway, she is as demented as Suarez but her bites don't hurt as much and pretty much we should all ignore her. The fact of the matter is the World Cup is so much fun. More fun than Nascar, the NBA finals or baseball which I think are the things she mentioned. Okay, minus Nascar. I've never been to a Nascar race so I'd better wipe that one off my complaints here. 1. Soccer is bloodier than most sports. And it's crafty-bloody. As in, there is no instant replay for the refs to look and say "wow, he really did bite that guy" or "I think elbowing his nose out of joint is cause for a yellow card." I saw Cavani chuck a guy out of bounds while the ref wasn't looking, I've seen all kinds of "hugs" and kicks and smooshes. Some of it makes me cringe--like Jones and the other guy (sorry terrible with names) from the US crashing into each other--that was worse than a Raiders game. The gauging and cleats flying is also scary... So not sure that is "fun" but anyway, it's ummm, entertainment. 2. The fans. Oh, my gosh, the fans. First and foremost, let's talk about the South Americans who are here (non-Brazilians). The Argentinians are nuts. We saw converted buses traveling from Belo Horizonte on their way to the next stop in Porto Alegre, covered with blue and white flags. One had hung a real air conditioner out the back window--you know a regular size window air conditioner--and was going hells bells down the highway. This is fandom. The Argentinian fans are so far my favorites--they were polite and good-humored and singing all the time at the Iran game. Love. Chileans are also here in force. I can hardly believe there are so many Chileans at all. A sea of red. I hope that if they win tomorrow against Brazil, there is not another type of sea of red. 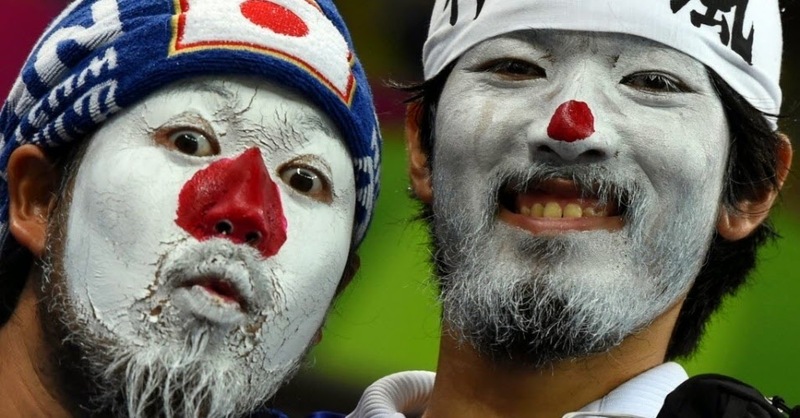 No, just kidding--this World Cup fandom is amazingly non-violent. There really are no fights between the fans--they can all sit in the stadium next to each other and no one dies like in club soccer. Love. Even on TV, you have to be amused by how fans dress, how they cheer, everything. It is a giant party. 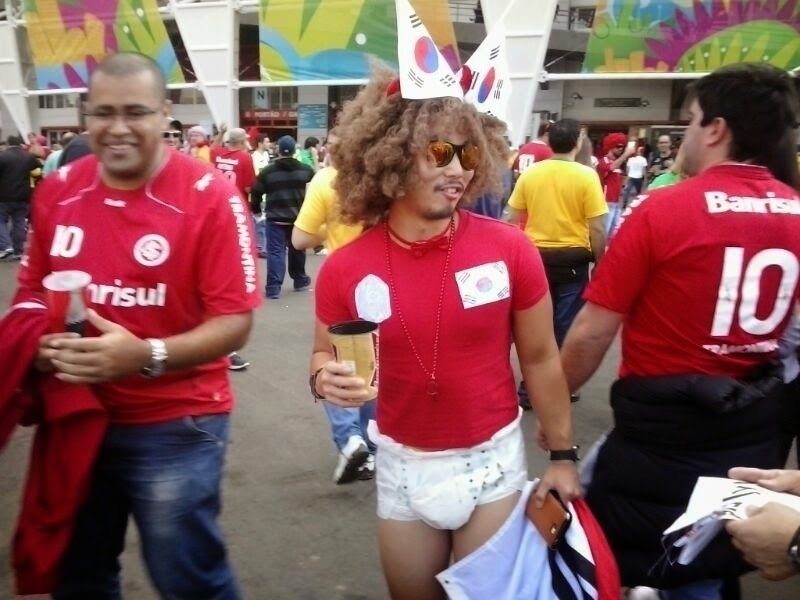 Yeah, I know I forget to watch soccer when watching the fans but it's hard not to when they are dressed in diapers and whatever else. 3. The stars. I mean the soccer stars. I love watching Messi, Muller, Robben, these guys who are living highlight reels. Yeah, if you hate soccer, you can catch the "real" highlights reel but you're missing the anticipation. And let's face it: soccer is all anticipation. 4. The joy. Imagine being one of these 11 players on the field and winning a World Cup match, 65,000 people watching you live, millions at home. It must be just incredible. I love watching the moments of joy, the teams streaming onto the field to hug and jump on and pretty much run over the goal-maker. Today is a day completely without games. I'm not really sure what to do with my afternoon. Well, okay, so I'm heading to my favorite sushi restaurant with friends, picking up a shirt for my son, and bringing the kids to swimming but I mean besides that! Oh, real life. So it will go on after this? Yes, and I will move from Brazil on July 23 with the best possible memories. I'm glad I stayed for this. 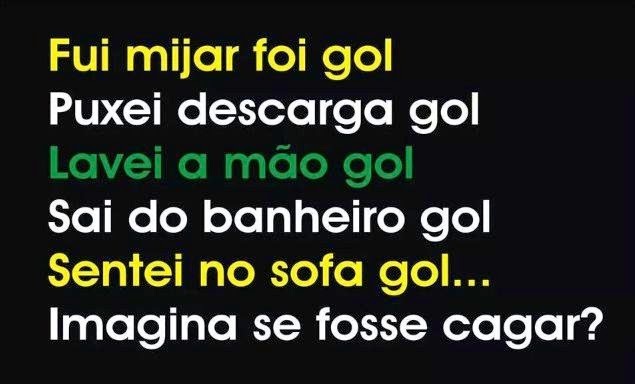 Tem Copa! This poster is on the side of a bus stop in the middle of Praça Panamericana, a heavily-traveled area in Pinheiros. I literally stopped in my tracks when I saw it. It reads "FIFA World Cup. It's where everyone wants to be." And it shows the four animals from the Madagascar movie. 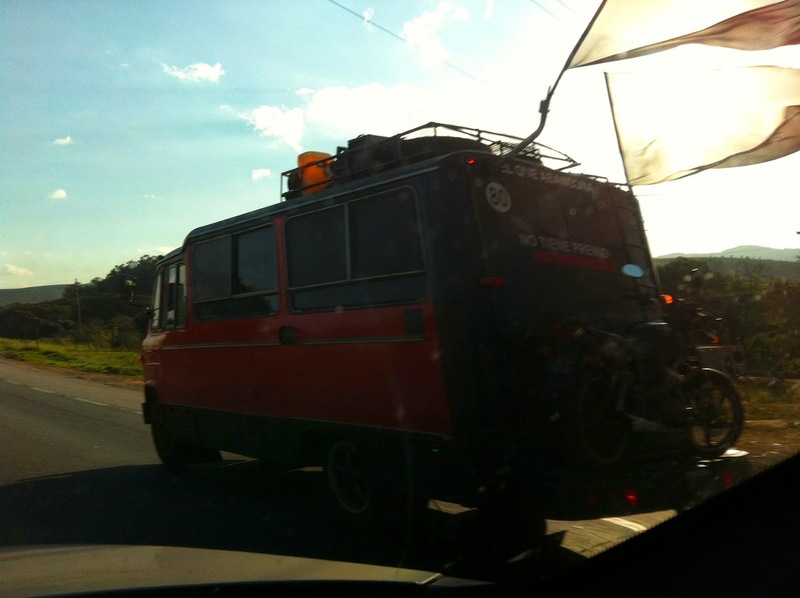 I loved the Madagascar movie--I want to move it, move it springs to mind numerous times in São Paulo traffic. But I'll say it here: this is the worst World Cup ad I have yet seen. Why do I think this? 1. Madagascar is not on our continent. 2. The four animals are looking terrified. Do they look as if they are wanting to be there? I assume that Visa was trying to make them look anxious about a goal being scored (on a beach? maybe not). Mostly they look like they're worried about a bus strike. 3. 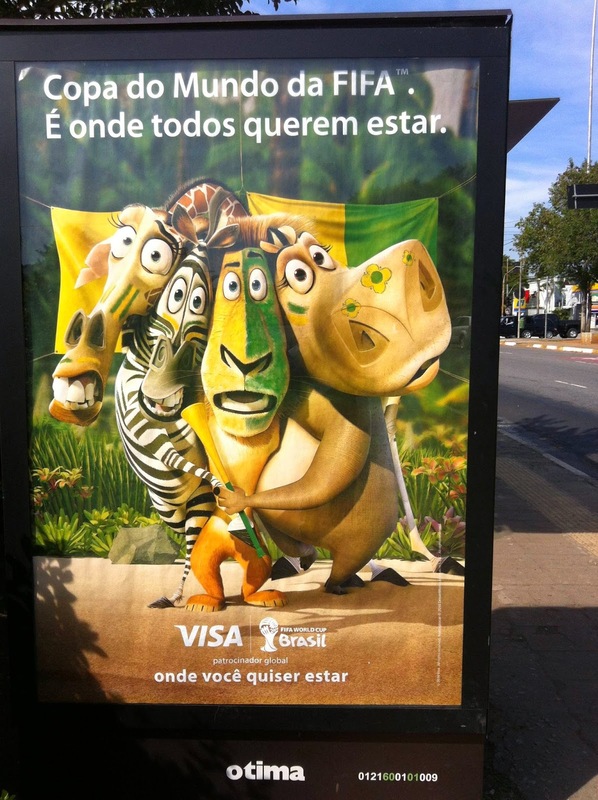 Not really sure what four zoo animals have to do with a payment card. It's not a feel-good ad. It's not a branding ad. I don't get it. Back to business school, marketing geniuses. This is not good. So way back in November 2013, I entered the FIFA lottery under two names: my mother-in-law's and mine. We tried for four different cities, 2 x 4 people in each game. In one of those weird coincidences of life, the only tickets we won were 8 tickets for Belo Horizonte and the game on June 21. Later we would find out that we would be watching Argentina play Iran--ironic on several levels since Argentina is Brazil's biggest rival, and Iran is the USA's nemesis. Both BH and I were wondering who in the world we would cheer for. No, actually I wasn't--Messi is one of the sons' favorite players, and I refuse to cheer for any country that treats women as second class citizens. So, BH was more of the one torn--while he likes Messi, no Brazilian can cheer for Argentina. As the game grew closer, it became clear that my mother-in-law would not be able to attend for health reasons. I tried several times to switch her ticket to my other son (the Messi fan was already going) but FIFA would not allow me to change the name on the ticket even to the grandson of the ticket buyer. There are some rules that are made to avoid scalping that are too general to allow any obvious exception. So we decided to take a risk and see if my son would be able to get in on my mother-in-law's discounted ticket (people over 60 and students are allowed half price tickets). We spent the long Corpus Cristi weekend (also a happy coincidence of when we succeeded in getting tickets) in Ouro Preto, an hour and a half from Belo. On Saturday, we left at 8 am for the 1 pm game, knowing that we had an hour and a half drive in front of us. The night before I had scouted out a residential street to park on about a kilometer from the stadium. By 10 am we had parked the car and were snacking on sandwiches on this shady lakeside residential street. At 10:30, we started our walk to the stadium, picking up more and more Argentinian fans on the way. 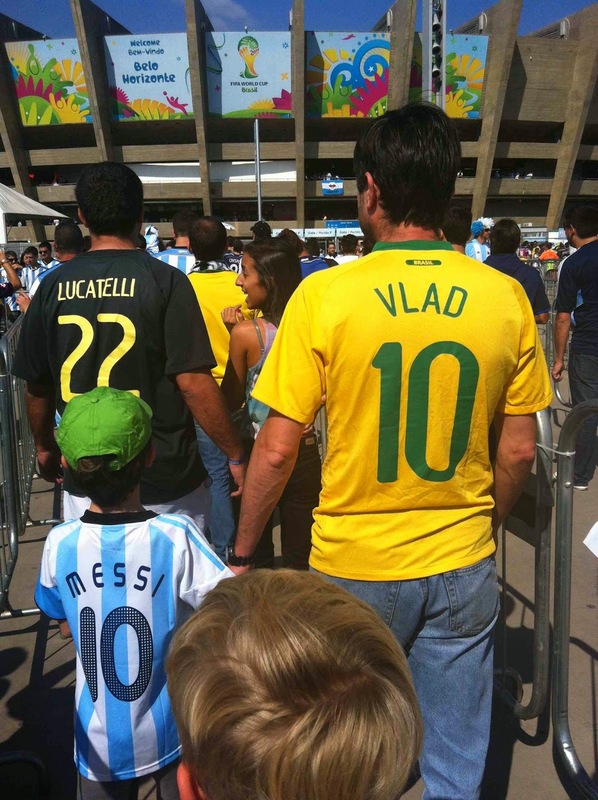 Most were dressed in sky blue and white soccer jerseys, many with Maradona or Messi written on the back. They carried flags, banners, signs and beer. They were generally well-behaved, though quite loud with a long playlist of Argentinian songs. My kids blended in with their Messi Argentine jerseys--one Brazilian fan was so convinced that the blond twin was Argentinian that he insisted on taking a photo with him even after being informed he was Brazilian, too. BH, his daughter and my brother in law were all wearing Brazil shirts and biting their tongues--the rivalry with Argentina runs deep. I was in white as was my father in law, my stepson in a neutral grey. We ran into a few Iranian fans on the way wearing white, red and green. A couple had turbans, one had a crown, all were few and far between. In general, the walk up to the stadium was incredibly pleasant along the lakefront and in a giant centipede of fans. Finally we arrived at the long uphill leading to the stadium, called Mineirão. Mineirão was not built new for the Cup, but extensively renovated and was the first of the 12 to be completed last year. We passed through three gates on this hill up to the stadium. The first just checked if we had tickets (we did), the second made us throw away any outside food or drink, the third checked inside purses and bags. 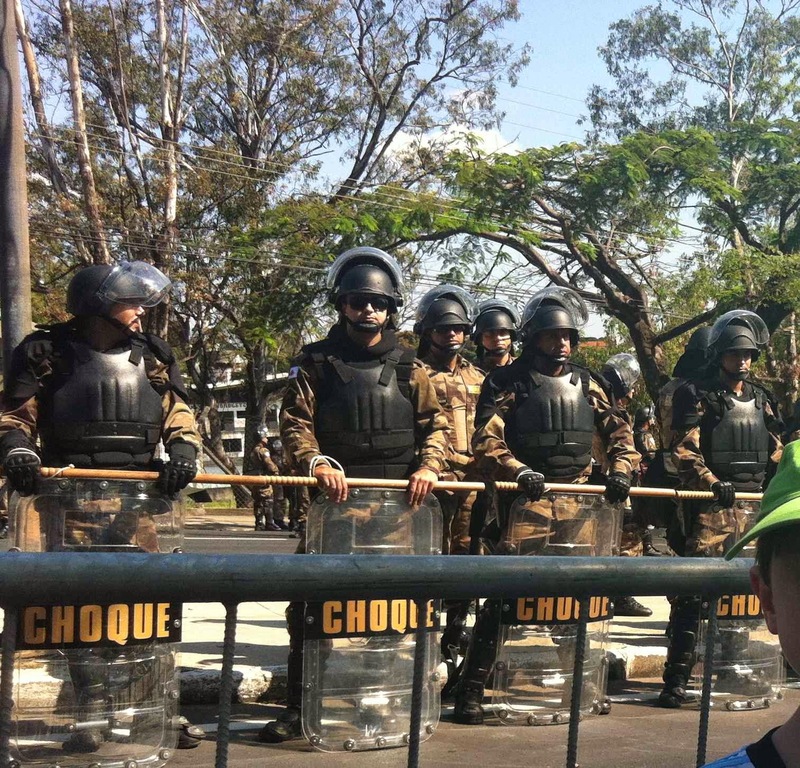 Then we walked past the "Tropa de Choque" or shock troops all armed to the teeth with shields and automatic weapons. Even their horses wore plastic eye guards for possible germ warfare (?). We saw not a single altercation at the game--but then we know the Pope is Argentinian, his boss is Brazilian and the Iranians care nothing about any of that. At the top of the hill, we came into view of Mineirão which looked impressive (though you have to like 60s architecture, one must say) all decked out in FIFA flags. We got into the short security line and went through the metal detector all in about 5 minutes. 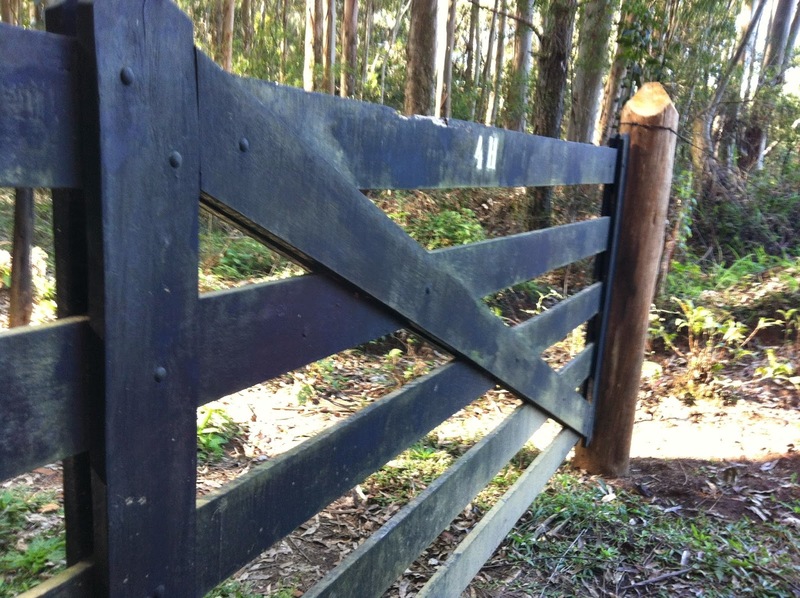 Then we found our gate and my heart began to beat faster. There was still the possibility that my 7-year old son would not be able to use the ticket of his grandmother and we would both have to sit outside the stadium for the game. We were sent to a special "preferential ticket holder" line for student and elderly ticket holders. My son passed through first, then the machine beeped asking for the document of the preferential ticket holder. My father in law handed over his. The ticket taker got a little confused about who had which ticket and in the end we all passed through. I was completely impressed with the organization of the stadium--well-signed and filled with volunteer helpers. No line for the women's room (for once!!) and we found our seats with an hour to go before the game. We had really lucked out in our ticket lottery--we were at midfield, with a great view of the big monitors as well. BH went off in search of food while we took selfies and tried to make heads or tails of the Argentinian fan chants. I dunno but probably something about Maradona. Or matte tea. No idea really. 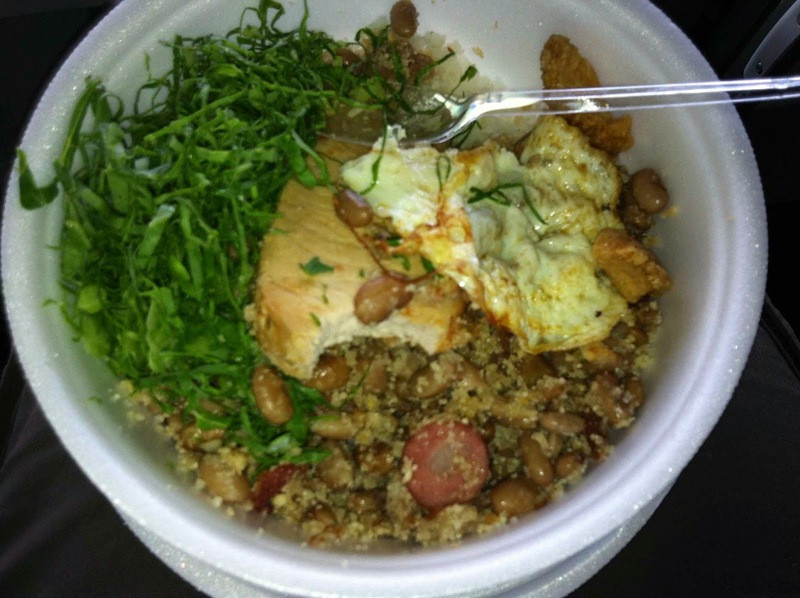 BH found us some "Feijão Tropeiro" which is a wonderful Brazilian dish of pork loin, beans, farofa, kale and an egg. Warm, delicious-- a little hard to eat with only a plastic spoon. Apparently there are certain foods that different regions cannot live without (the acarajé in Bahia springs to mind) and this food is offered in their regional stadium in addition to the hotdogs and hamburgers. Loved it. Beer was served in souvenir cups as was water and sodas. I had beer. Cold, fizzy, delicious. Better than any in the US parks (oh, all right, SF Giants stadium wins but barely--it's too cold to have a beer there anyway). We ate and watched the teams warm up and the Argentinians swarm in. 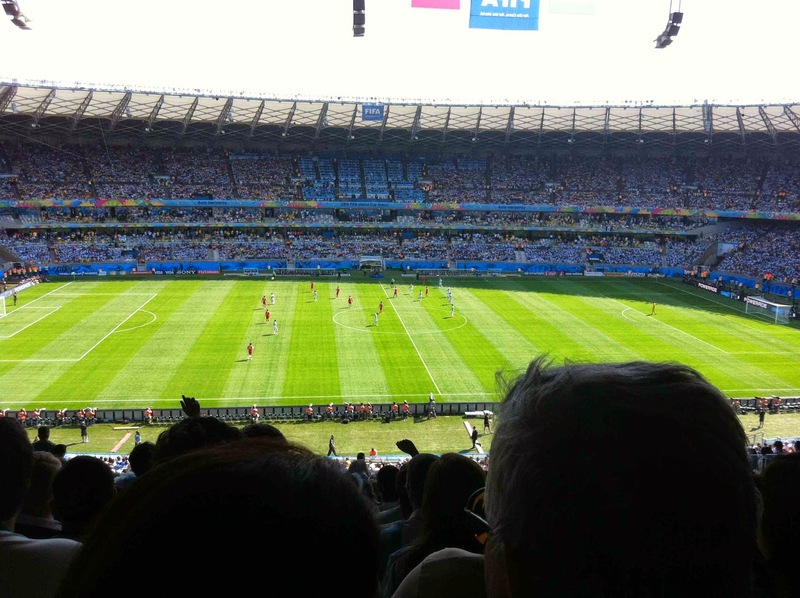 There were at least 25,000 Argentine fans, combined with around 20,000 Brazilian fans and then about 40 Iranian fans. Seriously. A sea of blue and white. I must say that Argentines are great fans--singing and dancing and jumping. And they were not getting into fights with the Brazilians even when the Brazilians started cheering for Iran. Yes, the Brazilians cheered for Iran. Loudly. Every time Iran got close to the goal and missed, you would hear a collective "ooooh" of disappointment. When they did a good defense or pass you could hear half a stadium sing "Ole, ole, ole, ola, Iran, Iran." I don't think Iran is that popular even IN Iran. Brazilians are so nice: they won't boo you but they will cheer for your opponent. I personally would never cheer for Iran. I do feel sorry for them and their whole one-shirt-for-the-whole-Cup thing (see this blog post) but I make it a policy not to cheer for teams that won't let me into their home stadium. Because I am a woman. Not because I feel very sleepy during soccer games. By 85 minutes and no score, the Brazilians were getting louder and the Argentinians quieter. The "Iranians" (Brazilians) had started singing "1,000 goals (as in Pele) and Maradona snorts cocaine". It sounds better in a song. I don't know--they showed crabby Maradona in the stadium on the big screen and I would seriously hate to meet him in a dark alley. I was very quiet. My son whose hero is Messi started to cry that there would be no goal by the Argentinian striker. He sat and mulled his hot dog while the Argentinians rose up as one and shouted "gooooooooooal" as Messi got a goal at 91 minutes. We all jumped up and down. The Argentinians were still standing and singing 10 minutes after the game ended and we left the stadium.